Vehicle Tracking transportation analysis and design software is built for vehicle swept path analysis. Engineers, designers, and planners can evaluate vehicle movements on transportation or site design projects. Vehicle Tracking software is available only in the Architecture, Engineering & Construction Collection. Design and simulation tools integrate with the AutoCAD environment. Optimize project performance and reduce rework. Easily explore design options and evaluate safety and standards compliance. Vehicle Tracking (formerly AutoTrack) is the leading swept path analysis software. The intuitive drive modes and dynamic path editing make it easy to assess existing conditions and evaluate design proposals for vehicle access. Whether you are checking driveway access for a residential development or route planning for wind farm components, Vehicle Tracking has the advanced tools to help. Animate your vehicle paths directly within the CAD environment without the need to export your design. 2D and 3D animations are possible with only a couple of mouse clicks, using multiple camera angles and even a record function. Lay out vehicle parking areas in minutes instead of hours. Quickly and accurately place rows, custom bays, and access roads. The parking rows are intelligent objects based on design standards available for more than 15 countries. Use the grips to easily edit the standards and streamline the evaluation of design alternatives. 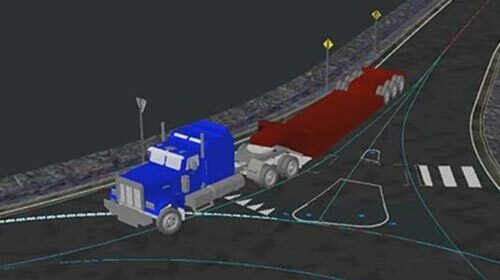 The road design tool uses intelligent objects to enable engineers to create and edit roundabout geometry quickly, easily, and to a variety of international design standards. Rule-based design criteria enable rapid model building; alter any section of road geometry, other related alignments, corridors, signage, analyses, and measurements update. This situation shifts the balance of project hours from drafting routine lines and arc segments to engineering design and optimization. In addition to the ability to auto-generate the parameters required for traffic analysis, the software also includes a built in bi-directional dynamic link to TRL’s ARCADY software, allowing for real-time feedback on traffic analysis as the roundabout geometry updates. Analyze all aspects of airside vehicle operations by checking taxiing, stand clearances, pushback maneuvers, jet blast safety zones, ground service vehicle access, and many others. Drive a huge database of aircraft and ground service vehicles are provided using any of the 5 main drive modes. The software’s Follow Drive mode lets you track the aircraft along the taxiway using any point you desire—including wingtip, nosewheel, and fuselage. Clearance envelopes for both body and wheels enable you to track critical points on the aircraft, making safety assessments easier. Check and assess the movements of trams and other light rail vehicles. The automatic Guided Drive mode will model the path of most trams with single or double multi-axle bogies, as well as suspended units. 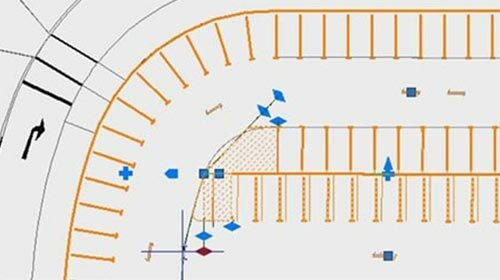 Use the Report Wizard to model clearance/safety envelopes and a special Pantograph Report to track the path of the pantograph independent of the rest of the vehicle. The hardware and software requirements if you’re running on a system installed with a 64-bit environment. Note: Other versions of MicroStation® and Bentley® civil products are not supported. Autodesk Vehicle Tracking 2016 can be hosted by MicroStation V8i (SELECTseries 1, 2, or 3), AutoCAD 2016, and the above-specified AutoCAD 2016-based applications on the same machine. AMD Opteron® with SSE2 technology. Intel® Pentium® 4 with Intel EM64T support and SSE2 technology. Intel® Xeon® with Intel EM64T support and SSE2 technology. This video demonstrates how engineers, designers, and planners can use Vehicle Tracking to analyze and incorporate the movement of vehicles throughout the design process.